So far, this year has not been very kind to Monsanto. With their lobbyists now banned from the EU parliament amid the body’s deliberations over whether to ban glyphosate entirely, Monsanto seems to be betting on the chemical it hopes will solve its glyphosate troubles — a herbicide known as dicamba. While dicamba has existed for decades, Monsanto has been busy retooling the herbicide, hoping to use it to replace glyphosate – not in response to concerns about glyphosate’s dangerous effects on human health but in order to tackle the development of widespread resistance to glyphosate among weeds in the United States and elsewhere. Many farmers who bought the dicamba-tolerant seeds, however, were unaware that the herbicide’s use was illegal or problematic — as Monsanto, in addition to other aggressive marketing tactics, only offered a warning regarding dicamba’s use slipped in well below its advertisement for dicamba-tolerant seeds. These out-of-date herbicides were banned years ago for use during the growing season due to their propensity to “drift,” or contaminate areas miles away from where they are sprayed. Given that dicamba is highly toxic to all plant life, the result was widespread crop damage. Last year, in Missouri alone, over 40,000 acres of farmland were damaged by dicamba drift. Despite the obvious problem, Monsanto’s newly reformulated dicamba herbicide was approved by the EPA last year, as the new product was ostensibly not as drift-prone as its predecessors. However, due to lingering concern over the drift, the EPA’s approval is set to expire in November of next year, when it will be subject to reapproval. Less than a year in, however, Monsanto’s promises of a “drift-free” dicamba have failed to materialize, as complaints have flooded into state agricultural departments across the country. So far this year, regulators in major soybean-growing states in the U.S. have received nearly four years’ worth of complaints regarding dicamba-related crop damage. The issue has been especially pronounced in Arkansas, where 985 complaints have been filed over dicamba-related damage, representing the vast majority of the approximately 1,200 total cases currently being handled by the state. The situation is so bad that Arkansas and Missouri, another hard-hit state, agreed on a 120-day ban on dicamba use within each state earlier this year in July. Arkansas is currently considering banning the herbicide entirely, effective April of next year. Monsanto, of course, is fighting back against the proposed ban. Though the most drastically affected, Arkansas is hardly alone. As of mid-October, the number of state investigations nationwide examining dicamba-related complaints totaled 2,708. Many state agricultural agencies are unable to cope with the increased load and have delayed other functions in attempts to address as many complaints as possible. “We don’t have the staff to be able to handle 400 investigations in a year plus do all the other required work,” Paul Bailey, director of the Plant Industries division of the Missouri Department of Agriculture, told Reuters. Despite the clear problem presented by the herbicide, Monsanto’s net sales have suffered no decline — climbing 8 percent, or $1.1 billion, in 2017, in part due to increased sales of dicamba products. However, Monsanto has failed to address the issue, only hazily acknowledging the existence of farmer complaints. “With significant adoption and a lot of interest in this new technology, we recognize that many states have received a number of reports of potential off-target application of dicamba in 2017,” Monsanto spokeswoman Charla Lord said last month, according to Reuters. Given Monsanto’s lack of response to the growing problem of dicamba drift, and its aggressive marketing approach prior to the herbicide’s approval, critics have asserted that Monsanto likely released the dicamba-tolerant seeds ahead of time in order to increase the chances of the herbicide’s approval by artificially creating an urgent need for the weed killer. Monsanto’s $1 billion investment in dicamba production before it was federally approved has also been cited as further evidence that the corporation sought to create dependency on its newest herbicide. 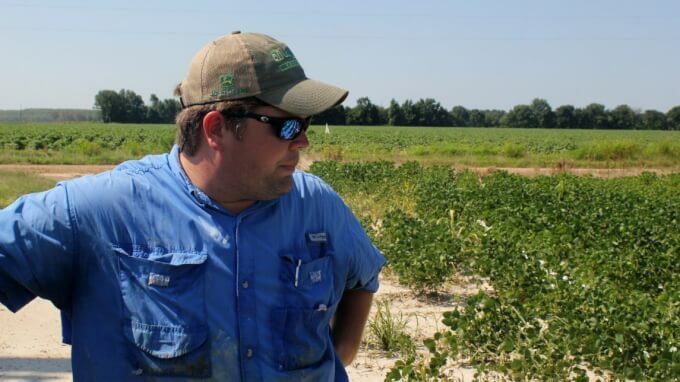 Indeed now, with dicamba drift a major problem following the herbicide’s approval, some soybean farmers have chosen to purchase the dicamba-tolerant seeds from Monsanto as opposed to facing the risk of losing their entire crop to dicamba drift. Monsanto is gambling on dicamba for several reasons, partly because there exists little scientific evidence linking it to adverse health effects in humans, though weak correlations between its use and increased incidence of lung and colon cancer have been found. While it is set to replace the now increasingly ineffective and controversial glyphosate, the massive amount of damage dicamba has allegedly caused in just its first year may present an even greater problem to Monsanto’s profits than glyphosate ever did. It is already drastically affecting the bottom line of the national agricultural industry and pushing state regulators to their limits. Yet, if history is any indication, Monsanto will not part ways with its newly approved product without a fight. This article (With Roundup On The Rocks, Monsanto Hatches New Seeds And A Dangerous New Plan) was originally created and published by MintPress News and is republished here under “Fair Use” (see disclaimer below) with attribution to author Whitney Webb and MintPress News.